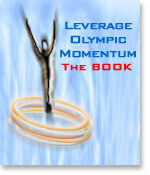 my new book, Leverage Olympic Momentum. Small and midsize business owners, or anyone working the Games must be ready for all eventualities. It is critically important that you are thoroughly prepared, and when opportunities arise you act immediately. You have to be up to speed as soon as you enter the race because it moves so fast you only get one chance to get it right. Holes in Olympic organizations pop up unannounced. If you are standing by ready to jump into action and provide a solution you have a great chance of selling your product or service at a premium. Like anyone, when Olympic organizations are desperate they will pay higher prices to save face and keep things moving. Try not to solidify deals too far up front. If you do you will place yourself at a disadvantage. Don't allow them to squeeze you to death, or prey on your good nature and change the deal in the 'Spirit of the Games' at the last minute. Many local power players in your region soon realize after a bit of negotiation and number crunching that they can do much better by operating on the periphery and concentrate on their core business. They still leverage Olympic momentum, but they do it independently. Many local power players do not pursue Olympic contracts. Consequently, it inadvertently presents an opportunity for a smaller competitor who in the normal scheme of things is so far down the line the local power player rarely sees them as a competitive threat. For example, Olympic organizations need security at a number of levels, from bag checkers to sharpshooters. They execute contracts with the military and local police to provide heavy artillery. Weaponry is usually out of reach for the average security company. There is however an opportunity for security product suppliers to negotiate contracts directly for very specific Olympic related hardware that a small company would not normally handle. Security is an extremely difficult challenge because it not only protects human life and property, it also generates the most public relations concern. Olympic athletes, Olympic VIPs and crowds, and Olympic facilities are all targets for terrorists and protesters. When you consider the weakest link in the chain theory it is not hard to understand that even a small problem in a seemingly low level area can escalate quickly into an international crisis that could be impossible from which to recover. Security at all levels is taken very seriously. In some respects the following extremely simplified example can apply to not only security, but also to catering, cleaning, merchandising, and transportation services. Your local Olympic committee meets with the top three security companies in the region and begins exploring interests and services. It won't take long for the three companies to realize that it will be harder to supply a workforce for the event than they anticipated. Top companies get to the top because they are organized. They also recognize when one of their clients is organizationally challenged. The security company that 'wins' understands they will be responsible to provide a service that delivers as contracted. If they feel they will be unable to deliver due to financial restraint or logistics challenges they will be extremely hesitant to put the reputation of their company on the line and open themselves to liability, lawsuits, or bad publicity. All companies have to carefully consider risk and how it will affect their position within the community over the long term. 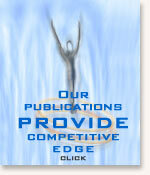 Top security firms often discover the risk does not outweigh the financial reward, level of prestige, or visibility. Security companies also recognize that as the Olympic event gets closer their services are going to be increasingly valued by current and new clients. When they consider all the ramifications it becomes difficult to get onboard with what from a distance at first looked like a slam-dunk. the top three companies decide to take a pass and instead service their regular and growing customer list - which is growing because everyone in town is getting nervous with the impending excitement and attention. The top three security companies have more work than they can handle, plus, if they are smart, they sit in the wings prepared to offer organizational and 'last minute' services to the Olympics during crisis situations. In fact they might have even explored some type of pre-negotiation in this regard, but if they are cautious they will not commit too far in advance. One reason many security companies hesitate to get directly involved is because they eventually realize they have to make their employee list available through a central labour pool, and this pool is available to their competitors. The top three security companies will not want to share their most valuable resource with each other. Security is a human resource industry. Hardware plays a role, but not as much as warm bodies. Top security companies have extensive training standards and often train internally. They invest hundreds of thousands, if not millions of dollars in their staff and they have no intention of jeopardizing their investment over a chaotic, poorly organized, seventeen day sporting event that will blow in and out of town and flatten them in its wake. This is by far the greatest risk. A single security company, even in the largest metropolitan area cannot possibly supply all the staff needed to properly service an Olympic event. The top three companies will not even be able to supply everyone needed. In fact even if you combine all the trained staff at all the security companies, big or small, you still would not have enough people to service the event. Security staff has to be pooled from current active workers in the entire region, plus, and this is a BIG PLUS, new workers have to be found, interviewed, hired, and trained. These new prospects can come from hundreds of miles away. The challenge is daunting. It's also important to consider the political implications of being an Olympic security supplier. The top companies in the region often indirectly establish municipal licensing regulations. They train their employees, and through this training maintain competitive advantage over the industry. Small companies cannot afford comprehensive training facilities and the capital needed to get recruits up to speed. Municipalities create licensing standards in conjunction with the top companies in the region. In other words, politicians and security companies work together to decide exactly what skills and accreditation is needed for specific license levels. You can't just fast track a recruit through two hours of training, give them a uniform, and expect them to manage high-level security situations. Many companies are moderated through government licensing, including security. Company number four is likely so far down the list they do not have a large roster of trained employees. In fact they might not have any staff licensed at the highest level. Top companies number one, two, and three use exhaustive licensing requirements to maintain their competitive edge in the market. They can literally keep small companies at bay. Company number four has the most to gain by becoming an Olympic supplier simply because it will have access to licensed security staff through the labour pool. Quite often licensed staff at the top three companies will put their names in the pool independently hoping to pick up what they erroneously perceive to be a prestigious freelance part-time gig at the Games. Some even do it anonymously due to non-compete agreements with their current employers. The point is, they are in the system, and company number four, and possibly all the other low-level security companies who want to supply the Olympics, have access to them. Company number four might not have the staff, but they have operational experience. The risk for them is lower when they balance it against all they have to gain when the Olympics leave town. Smart companies in the number four position know if they take the risk they can grow their company exponentially in a few short years. All they have to do is manage a system in partnership with the local Olympic committee. Unfortunately, it's not as easy as most think. What they probably won't realize until later in negotiations is that Olympic organizations will not hand over the very complicated operation of 'training and logistics' to a smaller company. That lucrative and relatively risk-free contract will go to one of the bigger companies in the area or to an international company. The smaller supplier will just be responsible for the almost impossible task of supplying bodies, but not for training. Olympic organizations also have a history of not paying suppliers on time and of not signing contracts in a timely manner. Contractors live up to their end of the deal, but due to organizational difficulties often beyond the control of Olympic organizations, they operate in limbo with little support. Company number four doesn't just wake up one day to discover they are over their head. They put their faith in the Olympic institution and only slowly get themselves into financial quicksand. It starts out with a modest investment of maybe $40,000, which in a couple of months grows to $60,000 and then maybe $100,000 by the end of the year. When would you bail and eat your losses? $60,000? 100,000? Remember, you initially trusted and based your decisions on the good name of the Olympic organization. Not to mention they are also pleading with you to give them a little more time to work out the kinks in their new operation. The opportunity is still exciting and you dip even deeper into your pockets because you trust everything will work out in the end. Don't be so sure. new book, "Leverage Olympic Momentum"